We decided “When in Rome, cook like the Romans do!” so my mom signed us up for a cooking class with Chef Andrea at Cooking Classes in Rome. (Miles and my dad went to the Explora kids museum for the day instead.) This was the menu for the class. One of Miles’s and my favorite dishes is spaghetti carbonara so I was excited to see it on the menu and now I’ll tell you how we made it! First, Chef Andrea talked to us about the ingredients. My mom usually uses pancetta in her carbonara but we learned that guanciale is better because it comes from the fattier jowl rather than the leaner stomach part. My mom also usually uses parmesan cheese but we learned that pecorino is the correct cheese to use. Oops! Finally we talked about the kind of pasta. Chef Andrea prefers fresh pasta made with all purpose flour and eggs rather than boxed pasta made of semolina flour and water because it absorbs the sauce better and makes the carbonara creamier. For the class we made spaghetti alla chitarra which was square shaped! Step 2. We made the pasta. Chef Andrea made a big volcano of flour and I cracked eggs into it, then it got gradually mixed together (I was on scraper duty to take the bottom edges of flour and push it into the eggs, being careful not to let the eggs run all over the table!) Eventually the walls did break and then we just moshed it all together. This got really well kneaded, and then rolled through a pasta machine until it was as smooth as a baby’s bottom. Then we used the chitarra to cut the pasta. The chitarra had a lot of taut strings like a guitar, and we used a roller to press the dough through the strings. Then we “played” the guitar and strummed the strings and the pasta fell through! Step 3. Back to the sauce, we whisked the eggs with a few handfuls of pecorino cheese. Step 4. We cooked the pasta in boiling salted water (it cooked really quickly because it was so fresh) then added it to the pan with the warm quanciale and a ladleful of pasta water. Chef Andrea gave this a toss with his wrist to mix it, then added the egg and cheese mixture and tossed it again, really well and really fast. The sauce became creamy and thick like magic! Step 5. He garnished this with more cheese and pepper and served it up fast. That’s the key with carbonara, it gets hard and dry quick. When my mom cooks it (with the wrong meat and cheese) she always calls to us five minutes before it’s ready so we can get washed up and be at the table when it’s ready. Chef Andrea’s carbonara was the best I ever had EVER! My mom’s is second best. Hopefully when we go home she’ll make it Chef Andrea’s way and then I’ll be happy forever and ever. Here is Chef Andrea’s recipe for the best spaghetti carbonara, used with his permission. The “spaghetti all chitarra” are squared-setioned egg spaghetti obtained by laying the dough on the Chitarra wires and pressing it by means of a rolling pin. In spite of their name this particular kind of pasta is squared and not round as normal spaghetti. Thanks to their square and also to their consistence they can absorb and keep the sauce particularly well. Spaghetti alla Chitarra pasta is made with all purpose flour and eggs which gives them a distinctive golden yellow color and it is very famous in the Abbruzzo region. It’s a very simple recipe to prepare, but you may want to purchase a “chitarra” maker to prepare it! For the pasta dough you have to mix 4 cups/400gr all purpose flour with 4 eggs. Then roll out the dough powerfully to a thin, almost transparent sheet (don’t forget to use flour on the marble surface). Now it’s time to cut the pasta into the “spaghetti alla chitarra” shapes, long and thin, as thin as you possibly can. Once ready divide the dough into quarters or more for ease of rolling. Roll these out using a rolling pin or pasta machine until smooth and thin, then use a rolling pin on the chitarra maker and your spaghetti with a squared section will come out of it! Either cook straight away, or dust with semolina flour to prevent them sticking while you prepare the sauce. Once in a pan of salted boiling water, they will get cooked in less than a minute and make sure they will be “al dente”. When the pasta is cooked, drain it and add it to the frying pan with the sauce and add freshly grated pecorino cheese, serve hot. In a large frying pan or skillet over medium-high heat, stir in the guanciale diced with extra virgin olive oil and cook until it starts to brown and gets crunchy. Remove the pan and set aside. Stir in few grains of cracked black pepper, only in case there is not enough seasoning over the guanciale strips previously diced. Put a large pot of boiling water over high heat. When the water is boiling, toss in a tablespoon of salt with the pasta. Stir to keep the pasta from sticking. Cook for a few minutes until a piece of pasta tastes cooked (if the pasta is freshly made you need less than a minute to cook, while if it is dried out then you need about 3/4 minutes to cook it). In the meantime whisk the eggs with half of the Pecorino Romano cheese into a bowl, making it as smooth as you can. When the pasta is cooked, drain it and add it to the frying pan with the guanciale mixture scooping out some of the boiling water, that will help you to moisten the pasta while sauteing. Saute over high hear for a few, scooping out more water from the cooking pot just in case it starts to dry out. Then turn off the heat and pour in the eggs, stir quickly until you reach your preferred consistency (but make sure it will not dry out, otherwise the eggs will turn your dish into a big omelette!). Season your dish with a good dose of Pecorino Romano cheese grated and garnish with pepper. Serve immediately, as this dish dries out very quickly. Note: make sure to save some of the pasta cooking liquid to add if the Carbonara starts to dry out. The trick is to rush the pasta to the table on warmed plates. ← Adios Spain, Buongiorno Italy! Wow Della! What a great post. Luca’s dad makes a mean carbonara too. Pecorino yes, but i’m not sure about the gianciale. We’ll ask him to make this recipe for us this weekend. Thank you for sharing!!! Della – great photos, great description! You made me hungry and I wish I could have been in the class with you. Magnifico! YUMMY!!!!!!!!!!!!!!!!!!!!!!!!!!!!!!!!!!!!!!!!!!!!!! UUUUGGGGGGG TAKE ME WITH YOU!!!!!!!!!!!!!!!!!!!!!!!!! I’M SPENDING MY LIFE DOING HOMEWORK!!!!!!!!!!!!!!!!!!!!!!!!!!!!!! Delizioso Della! We will have to try making this- it sounds delicious and not too hard. You look so cute in the photos- beaming and happy. Thanks for the post! Ciao! Wow Della! This is a great informational piece of writing. I loved your writing style and the content of your post. Nicely done! 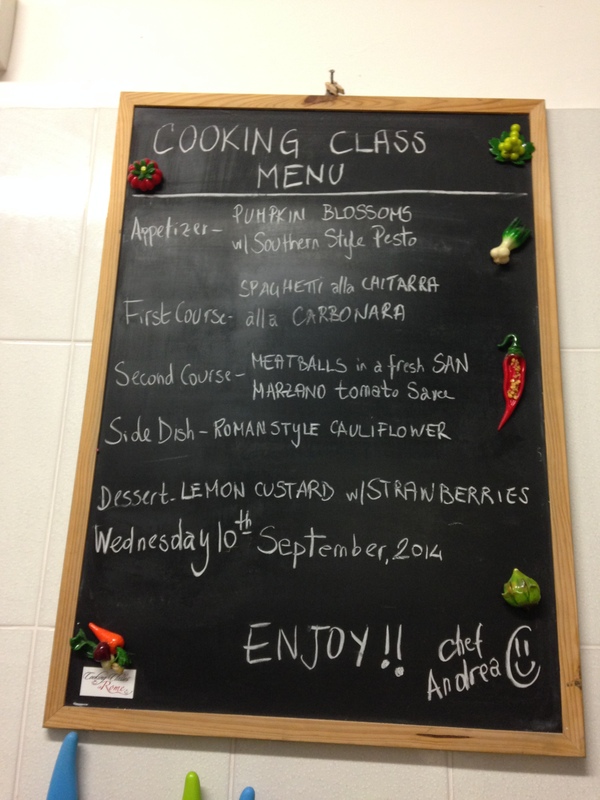 Thanks for your lovely post and I am glad yo’ve got to see and taste your favorite dish during your cooking class. It was truly a pleasure to have had you and your mom Jen in the kitchen last week, prepping and tasting the real flavors of the roman cuisine, and I am sure you will be delighted and you will delight as well many of your friends with a true and tasty roman Carbonara once you’ll get back home! Enjoy the rest of your travels and safe journey to you and you your family! Miss you in the kitchen, and I wish to see you again in the future whenever you will decide to come back and visit the eternal city of Rome!